Spring Savings At Utah Resorts - Ski. Play. Live. Spring break season in Utah is here. The slushy slopes are spilling with happy smiles and goggle tans. Take advantage of some recently added discounts to make those grins even bigger. If you purchase Canyons tickets through Axis Freeride you’re not only getting a slick deal but supporting a worthy cause. The non-profit youth organization provides kids a solid and safe foundation in terrain park riding. Buy adult lift tickets for $60 through Axis. That’s $26 off the online price and $47 off the window price. The ticket is good through the last day of the season. Just email HERE to get tickets. * They take cash, check or credit cards and it’s tax deductible. BTW, Canyons’ ticket prices drop to $59 on April 7 but they’re not tax deductible. This one’s a tease: Park City Mountain Resort will announce a deal next week and it promises to be news worthy so keep an eye on their website. Brighton isn’t exactly slashing for spring but they are slashing for ‘taxing’. April 15, they’re offering Tax Day relief with half off tickets…so that’s a $34 ski day. And on April 11, college students get half off with their student ID. Don’t forget about Alta’s Boarding Pass Program: Fly into Salt Lake City and ski at Alta or Snowbird the same day for half price. You have to register online before you leave to convert your airline boarding pass into a half-price AltaSnowbird lift ticket. The offer is valid within 24 hours of arrival, Monday through Friday, so if you get in at 9 p.m. you can ski the next day for half off! are teaming up with as many ski manufacturers as possible for “testing”. All you’ll need are your boots and a credit card (in lieu of a deposit) to ski as many skis as you can from 10 a.m. to 3 p.m.
Spring is the perfect time to get the little ones out skiing. 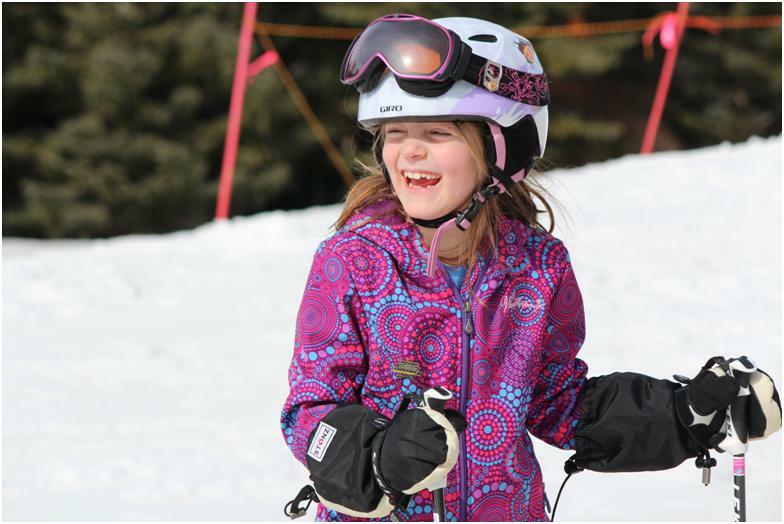 Kids 6 and under ski FREE at Eagle Point, Park City Mountain Resort, Powder Mountain, Snowbasin, Snowbird, and Solitude. At Brighton, the deal extends to kids under 8! Canyons, however, got stingy this year and lowered the limit at 5 years old. Finally, Costco in Salt Lake City has several lift ticket packages that will save you BIG bucks. You can’t order them online, however, so ask a friend to pick them up for you or get yourself a rental car for a quick roadtrip. PCMR: 5 tix for $350; Sundance: 2 tix for $87; Canyons: 2 tix for $150; Snowbird: 2 tix for $145.